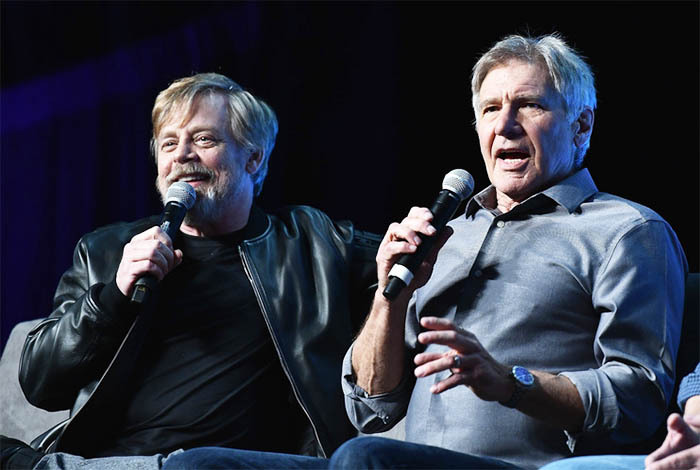 Attention Star Wars fans!… Harrison Ford, Mark Hamill and George Lucas made a surprise visit to the Star Wars Celebration in Orlando for a discussion of the historic film series, and its impact on their lives and on popular culture. Ford began by poking fun at the technical language Lucas wrote in the historic movie scripts, noting how he would need multiple takes during filming. From there, the trio considered the impact of the films. “It’s made no difference in my life whatsoever,” Ford joked. The actor who portrayed Han Solo throughout the films first began working with Lucas during American Graffiti, the first of many lucrative, culture-shifting collaborations together. Previous articleBEN AFFLECK & JENNIFER GARNER MARRIAGE OVER A LONG TIME AGO! Next articleSTAR WARS: THE LAST JEDI MOVIE TRAILER BREAKS THE WEB!